Well, I did it. I frogged the Anthorpology Capelet and am going to do a matching hat a scarf instead. Since I was using doubled worsted weight yarn, I think I'll have plenty. No I didn't take a photo before I frogged the capelet, it wasn't that great anyway! 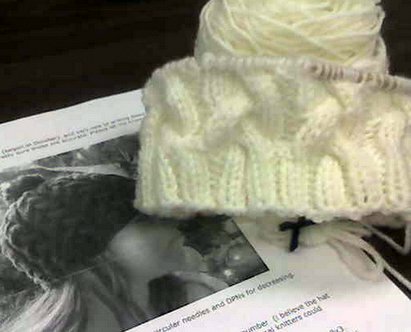 I originally started a 6 stitch right twist cabled hat, but found the pattern I was trying to locate in my big book 'o patterns. It's a 9 stitch braided cable and I love it! 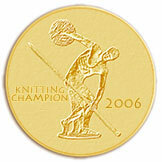 I cast on 88 stitches on a size US8 needle and I think it will be a perfect fit. I'm using the method of cabeling without a cable needle for the first time and I really like it so far. I think my stitches are more even than when I use a cable needle, for whatever reason. This will also be the first time I will make a pompom! Although I reserve the right to veto putting it on if I don't like it. Sometimes I think pompoms on hats look goofy. But the effect in the picture is nice. Hopefully I'll be able to finish the hat tonight during the knitting group and then start on the Irish Hiking Scarf to go along. I may decide to do a braided cable scarf to match the hat, but we shall see. I'm thinking of adding pompoms across the bottom of the scarf to match, what do you think? I was also thinking of making a hat to match Clapotis when I finish her, becuase the yarn is just too pretty. I think Cross Hat-ch would look cool in the yarn, but don't think the style of it goes with the scarf. Maybe something like Grumperina's Sarit hat. The curving ribs remind me of the rows in Clappy. I think it'd be super cute! Do you have the pattern for this hat or know where I can find it? I don't have it anymore, but I'm pretty sure I found it on craftster.org, maybe you can do a search and find it? Good luck!